Father Iggy O’Donovan celebrated the funeral Mass for my mother in Drogheda, a large town 30 miles from Dublin, in 2000 when she passed away. He did a fine job as he always did when his pastoral duties were called for. He was a people’s priest, hugely popular in Drogheda where his down to earth demeanor and friendly smile won him huge popularity. Now he has effectively been banished from his job and told to take a year’s sabbatical no doubt in some distant place because he has upset the church’s orthodoxy. Ignoring bureaucratic rules was something Iggy has done. I remember there was some silly rule at the time of my mother’s death that members of the family could not eulogize the departed. Iggy pointedly let me ignore it to speak about my mother’s life. A summer ago I was a passenger in my friend’s car when he got stuck on the beach in nearby Bettystown. Father Iggy happened to be taking his daily stroll, and he pitched in with the rest of the gang as we tried to push it clear of the oncoming tide. We had a laugh and a chat when the mission was accomplished. Iggy is the kind of priest who can make the Catholic Church popular again, a true man of his people. As prior at the local Augustinian church he was one of the best-loved figures in Drogheda, lately a depressed industrial town. But far from being celebrated, Iggy was under scrutiny from the very same church he was trying to humanize and make relevant again after its recent horrific history. He believed in ecumenism and bringing the different Christian faiths together. He scandalized the hierarchy by having a Protestant minister co-celebrate Mass with him in 2006. He barely escaped with his collar after that while pedophiles flourished. He was being watched and told people so. There were conservative spies, one man in particular who was reporting every possible transgression to the powers in Rome. There was plenty to report. Iggy spoke his mind and a great compassionate one it is. His farewell sermon was a beauty, forcing attention on Father Tony Flannery, silenced by the Vatican for his liberal views and persecuted ever since. Here is what he said. “I speak of Father Tony Flannery. If I had not been made aware first hand of the details of this case I could not have given it credence. “Even hardened veterans are shaken by the murkiness of the devious world of ecclesiastical politics. How has it come to this, that a great and good priest like Tony, who has dedicated his life to the preaching of the Gospel, is persecuted with a zeal that is as pathological as the paranoia that feeds it? Brave stuff. Maybe it is hopeful that in the reign of the new pontiff Francis such a speech will be looked on as provocative, leading to needed debate, not censure. 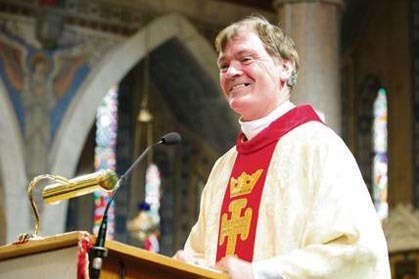 In an unprecedented move Drogheda Mayor Richie Culhane addressed the congregation and said he believed Father Iggy was leaving because "ultra-conservative elements within the church have forced the hierarchy to push Iggy further afield and out of Drogheda." The mayor spoke the truth. The massive applause and standing ovation for Father Iggy showed what the ordinary people thought of the Vatican witch-hunt. Iggy's legacy will long prevail after the Pharisees have departed.